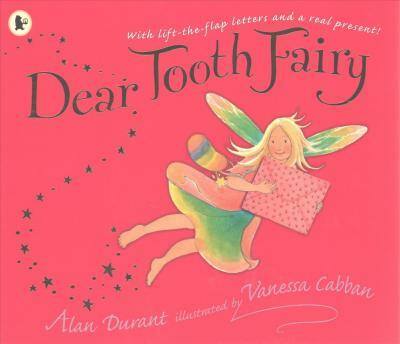 A book with fold-out letters and real gifts from the Tooth Fairy! When Holly's tooth falls out, she doesn't want to give it up to the Tooth Fairy, so she enters into a correspondence that is full of surprises, and she learns about the world of fairies. Featuring numerous fold-out fairy letters, a fairy identification leaflet, a riddle book and a special gold coin to keep from the Tooth Fairy. Alan Durant is a prolific author of novels and picture books for children of all ages, including Dear Mermaid (9781844280643) and Dear Father Christmas (9781406351491). He lives in Brighton, Sussex. Visit Alan's website at www.alandurant.co.uk. Vanessa Cabban studied illustration at Brighton University and the Royal College of Art. She has illustrated several picture books, as well as the bestselling Mole and Friends series by Jonathan Emmett, including Bringing Down the Moon, The Best Gift of All and A Secret Worth Sharing and Dear Tooth Fairy also by Alan Durant. She lives in Tweedmouth, Northumberland. Visit Vanessa's website at www.vanessacabban.com.